It's time to CELEBRATE! Today is the final day of sneak peeks for the new CAS-ual Fridays Stamps release! This is a SUPER fun die set that coordinates beautifully with the 8 Happy Nights stamp set, but you can TOTALLY use it on it's own or with other fun stamp sets. Which is what I did. Because I like to be contrary and such. Yup. I totes grabbed that 8 and made it into a birthday card! SO.MUCH.FUN. you guys! For reals, though. I will also be using this Fri-die set for some awesome Hanukkah cards, but when this idea came to mind, I simply HAD to play with it! Be sure to head on over to the CAS-ual Fridays Stamps blog to check out what the Ink Squad has come up with! So many fabulous card ideas! AND.. you can comment for your chance to WIN!!! YAY! Be sure to be ready, as these stamps will all be available in the CAS-ual Fridays Stamps store tomorrow... but probably earlier, because, let's face it, Michele LOVES to release new stamps for you guys!!! YAY! Love love love the non traditional use for the Hanukkah Fri-Dies! Way to stretch your supplies! So creative, Jingle!! 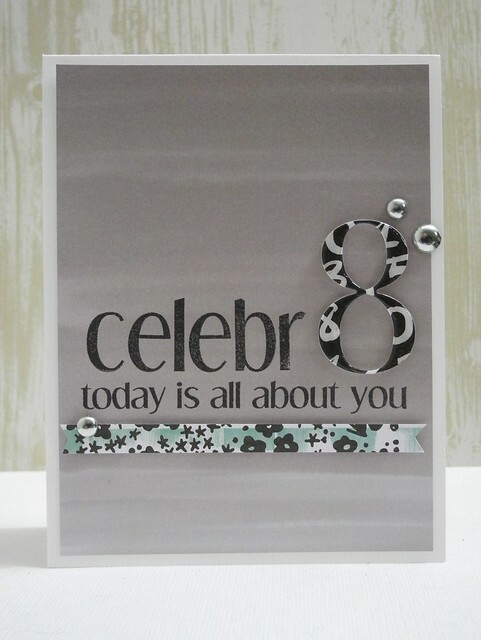 It makes me happy how "celebrate" still fits perfectly on a vertical card when you swap the "ate" for 8! Such a fun birthday card! Love the 8 die! Such a FUN and AWESOME card!!! Love it! Such a fun and clever card! Love the touch of teal - so pretty!! That is super cute. Well done!